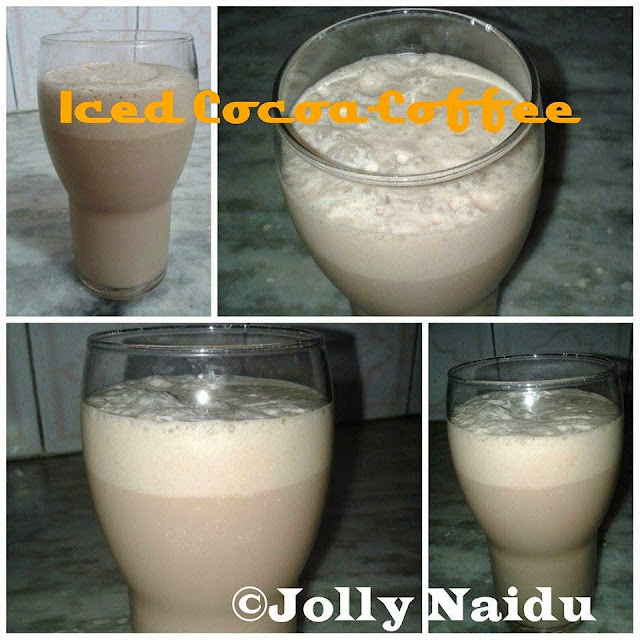 Beat the heat with cool & refreshing drink "Homemade Iced Cocoa-Coffee". This creamy coffee drink makes your day perfect. Instant coffee smoothie made with milk, coffee powder and other ingredients. This is instant breakfast meal also. This is my first experience to made this chilled tasty Iced Cocoa-Coffee and it was awesome & delicious too. I made this chilled cocoa-coffee with my own fusion. 1. Combine the cocoa powder, instant coffee powder, cinnamon and sugar. Add hot water and mix well till the sugar has dissolved completely. Add chilled milk and Mix well. 2. Chill for an hour or so. Just before serving, add some cream, vanilla essence and cinnamon powder and blend till smooth texture. Serve chilled.